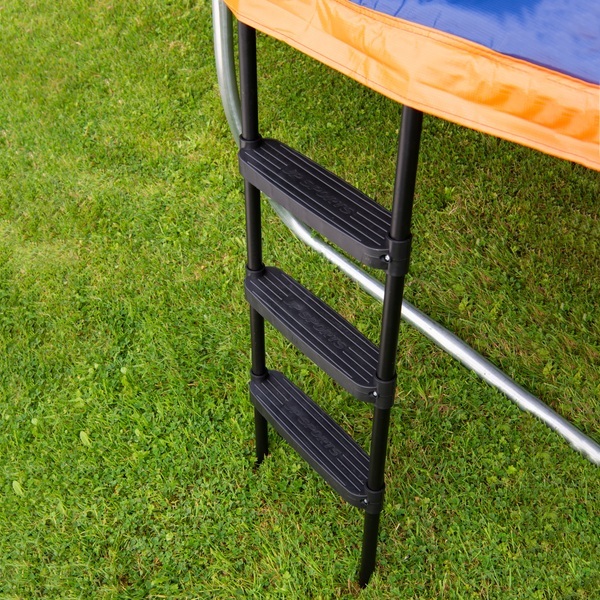 The 3 Step ladder for 12ft and 13ft Trampolines is the perfect addition to your trampoline. The use of a trampoline ladder makes it even easier to enjoy bouncing and playing outdoors in safety. The ladder is sturdy and extra safe to make sure that you don’t have to worry about accidents. The 3 steps of the durable Trampoline Ladder are spaced to allow your family easy access on and off your trampoline. The steps feature non slip grips, so that users can climb into the trampoline with ease and confidence. As the frames of trampolines keep the trampoline mat raised off the ground, there is a risk of users falling if they do not exit the trampoline properly. Trampoline ladders guard against this risk. They also help smaller users to gain entry safely, rather than by pulling themselves up onto the mat. As such, this 3 Step Ladder for 12ft and 13ft Trampolines makes an important safety addition to your trampoline. This 3-Step ladder is suitable for use with the 13ft Trampoline and Encloure (Ref: 162795) and 12ft Trampoline and Enclosure(Ref.162796). Sold separately.